Time to see what ya'll have been up to this past week! Any trash to treasure transformations? If so, this is the place to link 'em up! Did you miss anything that happened on Kammy's Korner this week? Now let's see some features!! 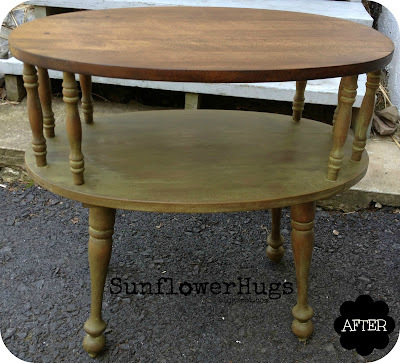 Sunflower Hugs and the woes of using old milk paint. Shabby Love revealed their kitchen redo and I especially loved the countertop they made with boards! Pretty shirt that you don't wear anymore? How about make a lampshade out of it like One Day at a Time did!! Remastered Relics' Silver Leaf Armour is stunning! Thanks for hosting, Kammy! That shelf was just the right touch for above your tub!! Still can't get over that gorgeous tub!! Enjoy the rest of your week! Thank you Kammy for featuring my kitchen reveal!!!!! :) Thanks also for hosting! Thank you for featuring my milk paint table!